Sophia Cutler is captain of the Medfield/Ashland/Dover-Sherborn (MADS) gymnastics team. While high school gymnastics is a team sport, some shoulders carry more weight than others. 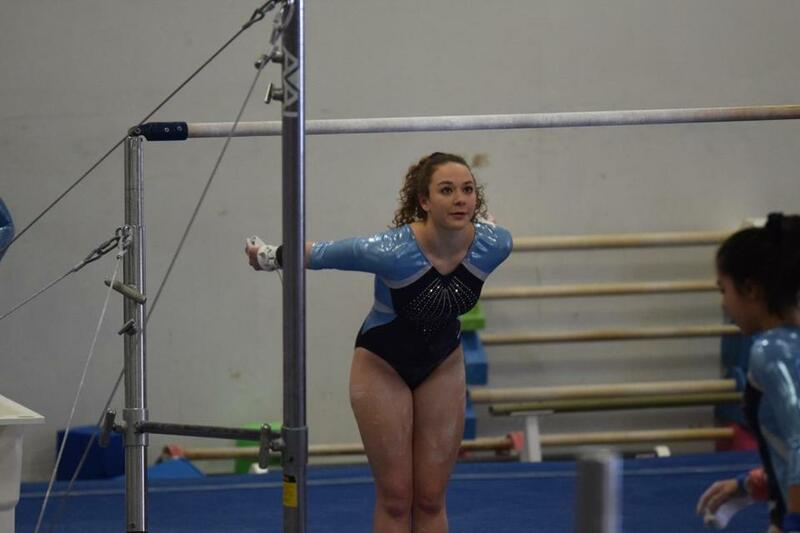 Sophia Cutler, the captain of the Medfield/Ashland/Dover-Sherborn (MADS) gymnastics team, competes in all four events — vault, parallel bars, balance beam, and floor — at each meet. Known as “All-Arounding,” this ambitious pursuit requires gymnasts to be in elite physical shape, as they often have mere minutes between each event. With her fellow All-Arounder, sophomore Kat Poulopoulos, away from the team and senior standout Meghan White out with a knee injury, Cutler was at her best on Jan. 27, posting the highest all-around score of her career (37.7) to carry her team in a 142.7-141.65 win over host Algonquin Regional. Cutler played a key role in helping MADS finish second in its first trip to the New England Championships last March, and has the team off to a 7-1 start this year, with its sole loss coming to defending state champion Bridgewater-Raynham/West Bridgewater. According to MADS coach Jennifer Libin, Cutler has developed a rhythm that allows her to transition from event to event while remaining consistent. Libin has coached Cutler since she began training at Gymnastics Express in Natick at the age of 9, helping her reach the “Xcel” level that is used to classify elite gymnasts in the USA Gymnastics program. But once she enrolled at Dover-Sherborn High, Cutler put club gymnastics on the back burner to focus on the more communal version of her sport. Bringing in athletes from four towns and three different high schools makes camaraderie essential for the MADS gymnastics team. And when you have a four-year starter and captain in Cutler setting the tone, forging that bond becomes much easier. Having an experienced mentor in Cutler has helped Poulopolous hone her skills as the second All-Arounder on the team. Only two gymnasts are allowed to compete in four events, so the Medfield resident appreciates the support of her senior captain. Described as an “old soul” by her longtime coach, Cutler has been a gymnast since she was 2 years old, and even earlier if you adhere to her mother’s quip that she began tumbling in the womb. While gymnastics has dominated her youth since she began competing at the club level at 6, Cutler has found plenty of time for other pursuits. At 15, she began working at Natick’s Morse Institute Library before training at the Express gym across the street. She studies the highest level of Spanish available at D-S and tutors in the language, while still finding time for numerous community service endeavors. Cutler is also the leader of a charity club dedicated to the memory of a classmate, Nora E. Searle, who lost a battle with cancer in 2012. She’s been volunteering for the Salvation Army in Framingham since sixth grade, is the lead discus thrower and captain of the D-S girls’ track and field team in the spring, and still finds time for year-round gymnastics training. Her steadfast attitude and selfless determination seems to make Cutler more of a natural All-Arounder. For Cutler, doing her best in all four events isn’t necessarily about achieving personal accolades. Rather, it’s about fulfilling her responsibility to teammates. “Our team is filled with amazing gymnasts, so it’s a responsibility to do well in all four events,” Cutler said.